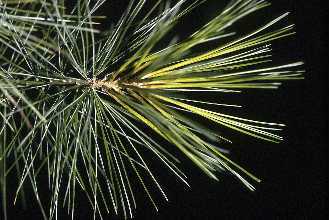 Eastern White Pine - Pinaceae Pinus strobus L.
The Eastern White Pine has 3 to 5 inch long needles. It grows well in heavy clay soils and has small fiberous roots which make it easy to transplant. It is used for screens and large hedges especially in new developments where soils may be compacted. It is also raised for timber. We always have a wide range of seedlings, transplants, liners, and B&B stock from 3' to 14'. Our larger trees are priced at about $10 per foot depending on the size of the order. Photo by: Robert H. Mohlenbrock. USDA NRCS. 1995. Northeast wetland flora: Field office guide to plant species. Northeast National Technical Center, Chester, PA. Courtesy of USDA NRCS Wetland Science Institute.